Terri and I have been incognito for the last couple of weeks because, as a lot of people already know, we were shooting scenes for a nationally televised show in which we will be starring. Crazy right? 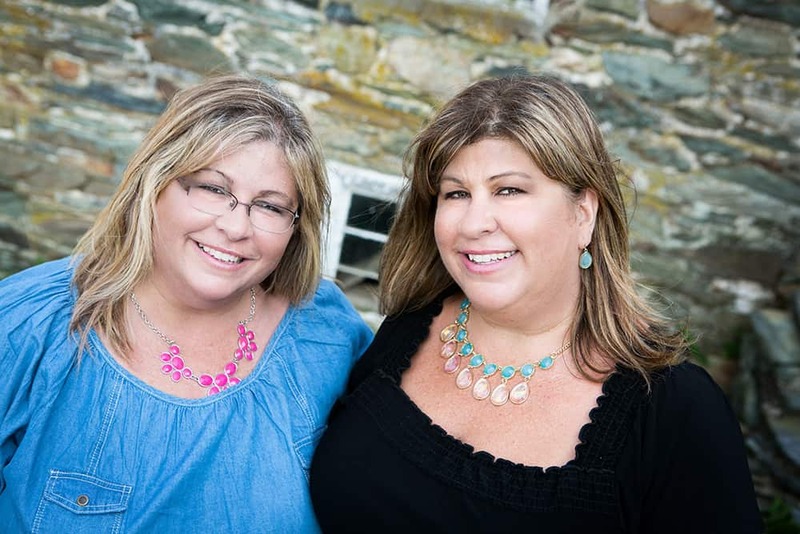 Little ole Pam and Terri from Frederick, Maryland. Who would’ve thought? We will definitely be sharing our experience with you once the show airs. So stay tuned! And now we’re back to blogging. Whew! Housewives of Frederick County, I’ve missed you so! 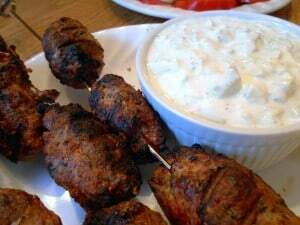 I’m coming out of the gate with a new Weight Watchers friendly recipe I found on one of my favorite recipe blogs, LaaLoosh. This site offers an abundant amount of mouth-watering, healthy recipes with the Weight Watchers Points Plus Values included. This particular recipe is called Middle Eastern Turkey Kebabs & Cucumber Yogurt Dip. 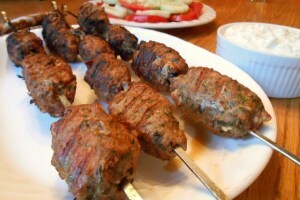 I don’t know about you, but I absolutely love any type of kebab and any type of Middle Eastern dish. And to find something that is only a 6 Weight Watchers Points Plus Value makes it all the more heavenly. 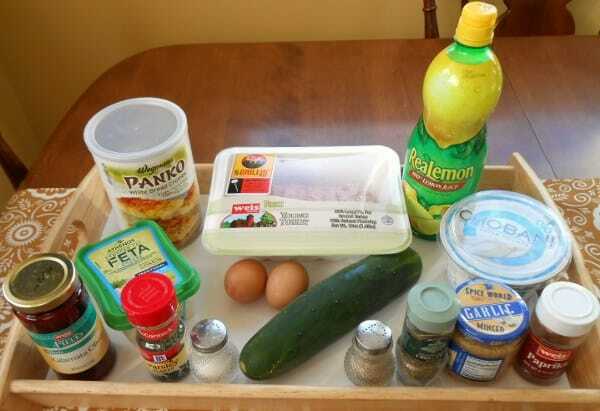 Start by making the yogurt dip. 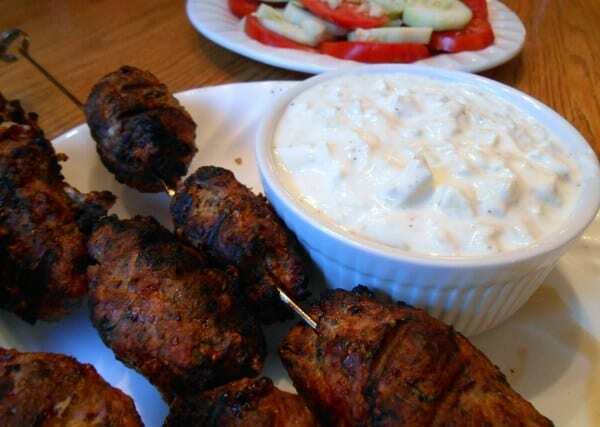 Combine all dip ingredients in a small bowl, and set aside. Now make the kebabs by combining all the remaining ingredients in a large bowl. Using your hands, mix well. Let the meat sit for about 30 minutes to allow the flavors to meld. Preheat grill to medium high heat. Form the meat onto 8 skewers. 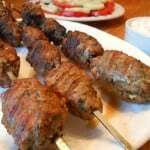 Place skewers onto grill. Don't flip or move them until the bottom side is cooked; the meat will easily release from the grill when it's ready. If you force it too soon, the kebab will break apart. When ready, gently flip over using a spatula. Cook until desired level of done-ness is reached. 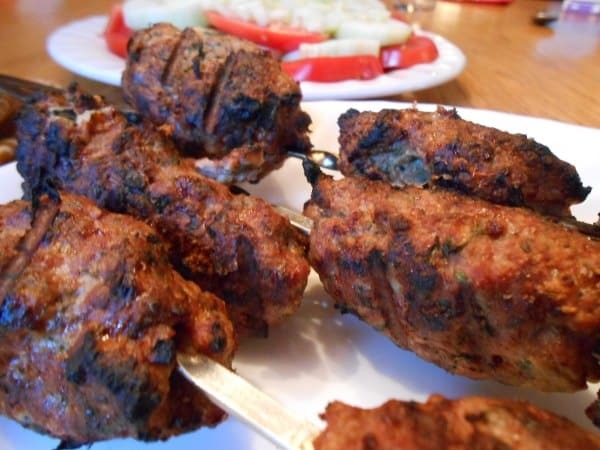 Remove from grill and let rest about 5 minutes before serving. 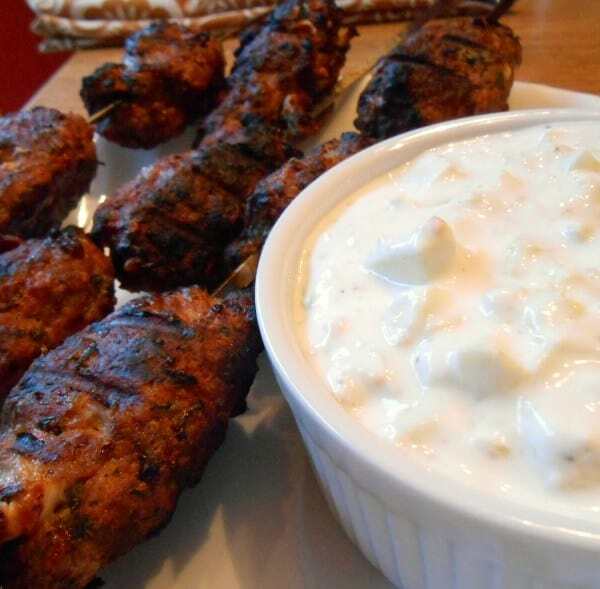 Divide yogurt dipping sauce into 4 small bowls and serve with kebabs. A note about the Kalamata olive juice – I couldn’t find just the juice, so I bought a bottle of Kalamata olives and drained the juice from it. 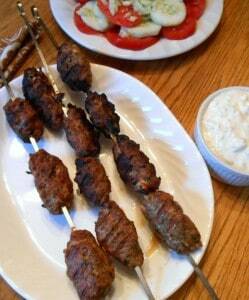 I was very nervous about forming the mixed meat onto the skewers. It didn’t seem to be sticking enough and I was afraid the meat would fall off the skewers and onto the grill. I was very close to just baking it in the oven and turning it over halfway through so that both sides could be browned. However, my husband, being the expert grill master that he is, reassured me that he would be very careful and not allow any of this Middle Eastern goodness be wasted. They turned out even better than I had expected. I thought that they wouldn’t taste as good as lamb kebabs. But they were just as good, if not better. And knowing that they were so much healthier than eating the more fattening lamb version, made it that much tastier. The only thing I wish I had made as a side dish to go with it is basmati rice. That would have been the perfect combination. 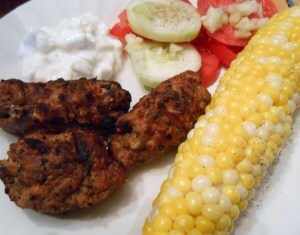 However, I did accompany the kebabs with corn on the cob and a cucumber/tomato salad. The kebabs, along with the cucumber dressing were so very tasty! My husband could not stop raving about how good they were. This will definitely be a recipe that I will make again. So thank you once again LaaLoosh for another fantastic Weight Watchers friendly recipe. It got my family’s stamp of approval! Hopefully it will for your family too! Yum, I’m about to make dinner and wish I had the ingredients to make this tonight–but will and soon!!! You will love it Cheryl! It reminds me of the food they serve at Ayse.